The dramatic emptying out of Calgary's downtown office towers as energy companies laid off thousands of people and a deep recession took hold in the province is well known. An interactive map shows the floor-by-floor aftermath of the loss of tens of thousands of energy jobs in the city's core. 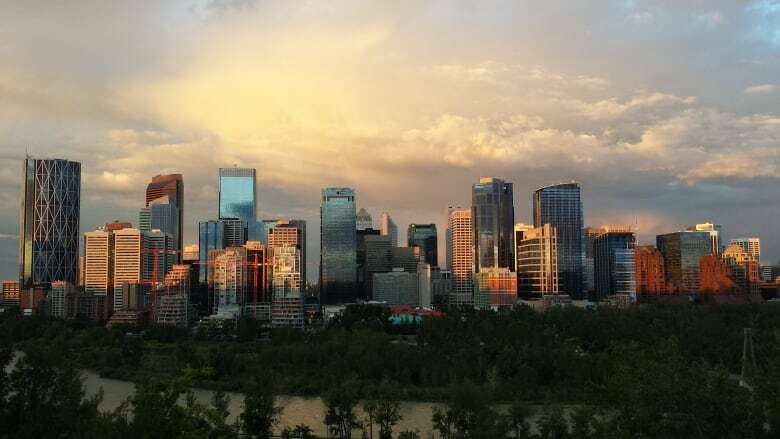 It's no secret that one result of the collapse of the price of oil four years ago was a dramatic emptying out of Calgary's downtown office towers as energy companies laid off thousands of people and a deep recession took hold in the province. The vacancy rate in Calgary's core skyrocketed from about 10 per cent at the end of 2014 to very nearly 28 per cent last year, according to the latest real estate market outlook from CBRE. But driving through Calgary's downtown core, you'd have a hard time pinpointing which towers were left sitting with floor upon floor of empty space and which ones emerged from the recession still relatively full of tenants. 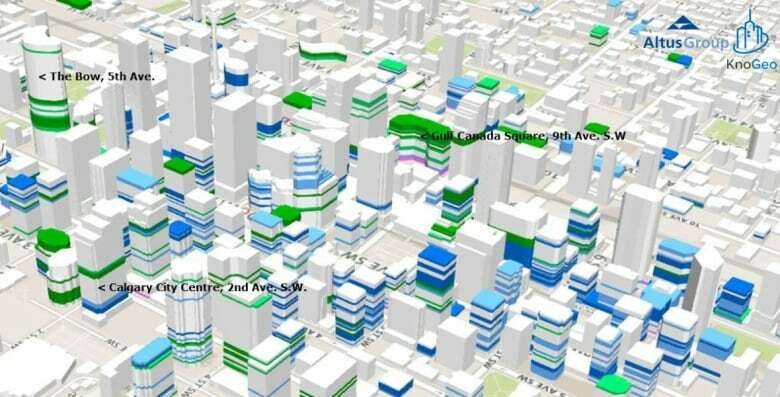 ​An interactive map of Calgary's downtown office towers on the website for the Altus Group answers that question — laying out in floor-by-floor detail what a 27.7 per cent vacancy rate actually means in a physical sense. Altus Group is an international real estate services company that tracks major commercial sales transactions and leasing trends across Canada and provides analysis for its roster of clients, which includes some of the biggest real estate holding companies in the world. The interactive tool creates a stark visualization of just how much space we're talking about when we say Calgary's downtown office district is more than a quarter vacant — particularly if you look at 2018 compared with the situation in 2014 (see the top image). And as you zoom in and out and click on any of the coloured-in floors — dark blue for direct lease, light blue for partial direct lease, dark green for sublease, and light green for partial sublease — you see the physical stamp left on Calgary by the loss of thousands of corporate jobs as companies folded up or downsized in response to the sliding price of oil. Altus Group vice-president Ray Wong says one of the most striking things about the vast amount of space available in downtown Calgary is how much of it is being marketed as sublease by companies that have perhaps traded up to newer, nicer space that became available at attractive prices. "The way it impacts the landlord, the positive thing is that they are still getting rent on that space, but with the landlords having their own space available, they're competing with that sublet space to attract tenants to fill that space," he said. Toronto, by comparison, has an overall downtown office space vacancy rate of under four per cent, and very little of it is available for sublease, Wong said. 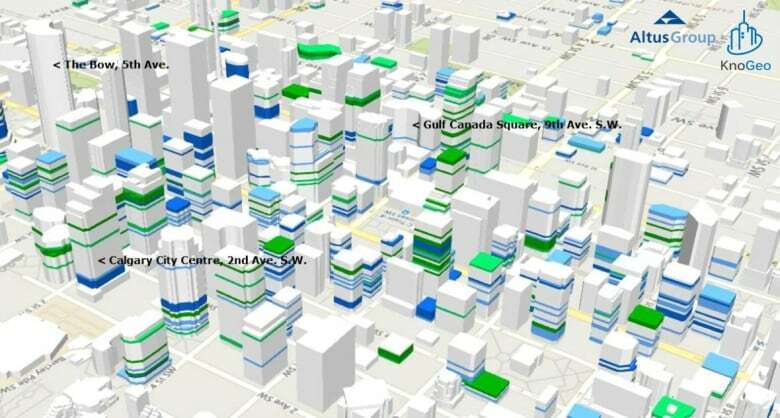 The Altus Group map shows that, in general, Calgary's newer office towers have higher occupancy rates, while many of the older buildings have a greater number of floors available for lease. Just as the downturn hit, several new office towers had recently been built — including The Bow tower, Penn West Plaza, the two Centennial Place towers and Jamieson Place — or were underway or nearing completion — such as Calgary City Centre and Brookfield Place. Just how many jobs have been cut in the oilpatch? In the just-completed 56-floor Brookfield Place tower at Sixth Avenue and Second Street S.W., only 11 floors — four through 14 — are still available for direct lease. And the 37-storey Calgary City Centre tower at 215 Second Street S.W., finished in 2016, is also largely full, with just four floors showing on the interactive map as available. On the other hand, both of the Livingston Place towers on Third Avenue S.W., built in 2005 and 2008, have several floors up for direct lease or sublease — seven out of 21 floors in the west tower and 12 of 22 in the east tower. And the brand new tower, 707 Fifth Street S.W. across from the Calgary Courts Centre, has floors four through 15 available for direct lease, plus four more entire floors up for sublease. But in general, it's the older office towers that look to have experienced the most striking exodus. In the circa-1958 Britannia Building at 703 Sixth Avenue S.W., most of its nine storeys of Class C office space are fully or partially vacant. The top three floors and the second floor are up for direct lease and the third through sixth floors are partially available. Across the street in the Bantrel Tower, a Class B office tower built in 1969, six full floors out of 23 are up for direct or sublease, and another six floors are partially available. The 10-storey Class B building near the west entrance to the core, built in 1979 at 909 Fifth Avenue S.W., appears to be completely up for grabs. Floors two through 10 are available for direct lease, plus there's retail space for lease in the lobby. At the core's east end, another tower that went up during the early 1980s oil boom — the 26-storey Hanover Place at 101 Sixth Avenue S.W. — has 16 entire floors available for direct lease and another six floors with pockets of space available. The interactive map also shows that Watermark Tower, a Class A building built in the early 1980s at 530 8th Avenue S.W., went from being practically fully leased in 2014 to having nine full floors out of 27 available four years later, plus seven more floors partially up for rent. The 33-storey Fifth and Fifth building at 605 Fifth Avenue S.W., built in 1980, has 10 full floors of Class A space available for either direct lease or sublease, plus portions of another four floors available. Four years ago, the building had only one partial floor up for lease. Wong says that while it's likely going to take a long time for all the unused office space to get reabsorbed, he's bullish on downtown Calgary's prospects for a rebound. "The key issue, I think, facing the office market nationally is the chase for talent, finding qualified people to fill key positions, in either the tech sector, the energy sector or skilled labour. And that's what Calgary has," he said. "So you have seen, over the last couple of years, an increase in … tech firms looking at the Calgary marketplace." And thanks to a pre-recession building boom, Calgary also has an enviable inventory of high-quality, modern office space, with top-drawer heating and cooling systems, environmentally friendly footprints, and motivated landlords, Wong said. "There's increasing interest from tech companies and other service companies just because of the rental rates and availability of really good office space," he said. In the meantime, Wong says, owners of buildings with hundreds of thousands of square feet sitting unleased have to do the math and weigh their options. "It boils down to cost. He or she could have other buildings in their portfolio that are performing well. And this could be a one-off. And they can sort of weather the storm," he said. "But with that building empty, they're probably looking at it from a rental rate perspective. What type of inducements can they give the possible tenants to lure them into that space? And what would the cost be to renovate it to a better class building, and again, is that feasible based on the current market conditions?" CBRE predicts 2018 won't bring any big rebound for Calgary's downtown office vacancy rates. 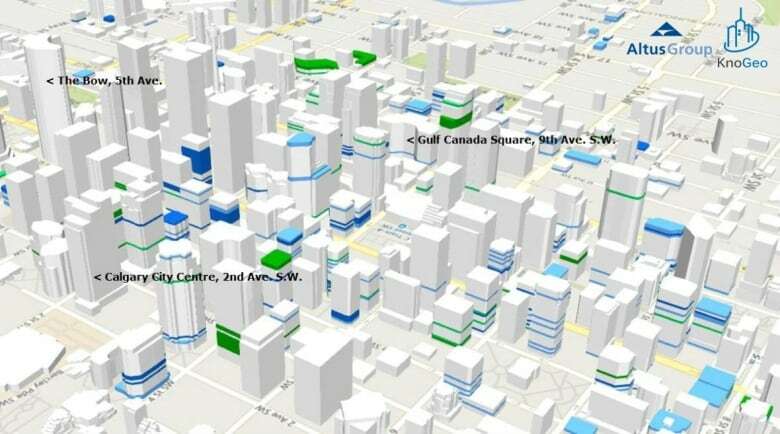 "Despite improvements to the overall Calgary economy, downtown energy companies have, and will continue to, decrease the size of their footprints due to consolidation and asset rationalization," its report says. "With some green shoots popping up, smaller deal sizes under 15,000 sq. ft. will continue to make up the majority of the market activity." CBRE also notes that there is still another 430,000 square feet of new office space under construction.